Our unique blend of 2.5% Retinol with moisturizing Hyaluronic Acid, Organic Jojoba Oil, Aloe, Green Tea, Shea Butter, Vitamin E and Vitamin B5 offers superior results with great quality. Safe for all skin types, including sensitive skin, and can even be used around the eyes. Retinol is a type of Vitamin A that fights signs of aging and reverses skin damage caused by exposure to the sun, wind or cold weather. In addition to reducing the appearance of wrinkles and fine lines, Retinol helps improve skin texture, tightens pores, and stimulates collagen production. Our Retinol Cream reduces fine lines and wrinkles, helps repairing skin damage and stimulates collagen production, resulting in healthier, smoother and refreshed looking skin. 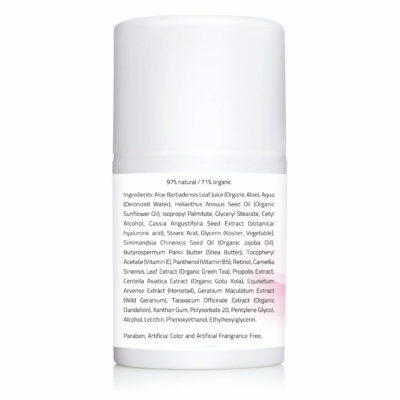 Our blend of organic and all-natural ingredients provides you great results without irritation, redness and dryness. We use the highest concentration of plant based and active ingredients possible to deliver a healthier and more youthful appearance while hydrating without a greasy residue. Contains natural and organic ingredients with no harsh chemicals, no parabens, and no artificial colors, fragrances, or dyes. Made in USA. Click and get your best Retinol cream NOW! 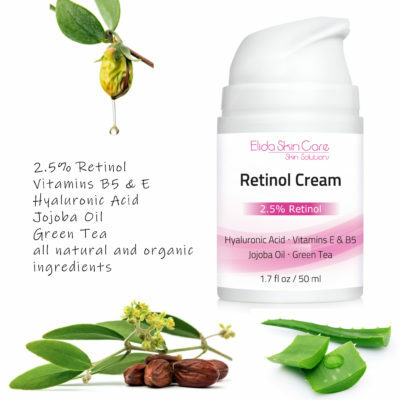 For best results – Elida Skin Care Retinol Cream was created with the best organic ingredients for your skin such as Hyaluronic Acid, Vitamin E, Vitamin B5, Jojoba Oil, Shea Butter and Green Tea. Retinol is clinically proven to improve fine lines and wrinkles and pigmentation in as little as about 12 weeks. Our Retinol Cream is the perfect daily moisturizer to help improve skin tone and texture by working to reduce wrinkles, discoloration, acne, fine lines, sun damage, spots and other marks. Retinol is considered to be one of the most powerful and potent anti-aging ingredients in the beauty industry for its age-kicking capabilities. Our organic cream heals, repairs, calms and brightens giving you an even skin tone and smooth, radiant skin! For men and women and all skin types. 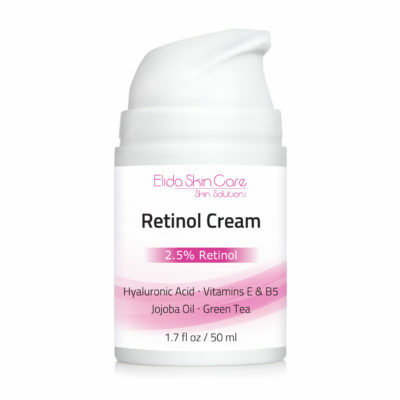 Elida Skin Care Retinol Cream improves skin tone without oily residue left behind. Our cream quickly absorbs without a heavy or sticky feel. Light and pleasant smell, non-GMO, no artificial fragrances, no paraben and cruelty free. Made in USA. We expect only the best results from the products we use at home, and we know you want the same. When you buy with us, you’re not only buying superior quality, but you buy a natural and effective product. Ingredients: Aloe Barbadensis Leaf Juice (Organic Aloe), Aqua (Deionized Water), Helianthus Annuus Seed Oil (Organic Sunflower Oil), Isopropyl Palmitate, Glyceryl Stearate, Cetyl Alcohol, Cassia Angustifolia Seed Extract (botanical hyaluronic acid), Stearic Acid, Glycerin (Kosher, Vegetable), Simmondsia Chinensis Seed Oil (Organic Jojoba Oil), Butyrospermum Parkii Butter (Shea Butter), Tocopheryl Acetate (Vitamin E), Panthenol (Vitamin B5), Retinol, Camellia Sinensis Leaf Extract (Organic Green Tea), Propolis Extract, Centella Asiatica Extract (Organic Gotu Kola), Equisetum Arvense Extract (Horsetail), Geranium Maculatum Extract (Wild Geranium), Taraxacum Officinale Extract (Organic Dandelion), Xanthan Gum, Polysorbate 20, Pentylene Glycol, Alcohol, Lecithin, Phenoxyethanol, Ethylhexylglycerin. For up to eight-fold antioxidant protection, ninety-six percent reduction of sunburn cells, and prevention of the formation of free radicals in sun exposed skin. 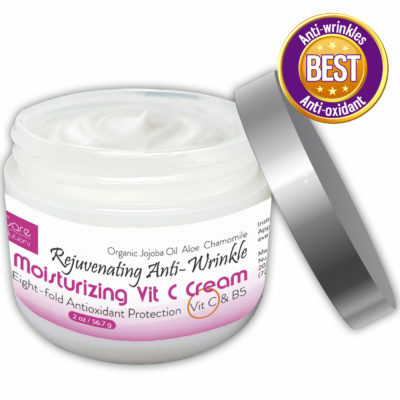 Rejuvenating anti-wrinkle moisturizer with anti-aging properties. Fades sun spots and discoloration, refines skin texture and reduces wrinkle formation as well as minimizes existing wrinkles. Our Vitamin C cream makes your skin feel soft and hydrated all day long. Contains a nourishing blend of Vitamin C, Vitamin B5, MSM, with moisturizing Organic Coconut Oil, Cocoa Butter, Jojoba Oil, Aloe Vera, Rose Hip, gentle Chamomile and much more to give your skin the best what nature has to offer. Non-irritating formula great for all skin types. Contains natural and organic ingredients with no harsh chemicals, no parabens, and no artificial colors, fragrances, or dyes. Gentle enough to be used morning and night. Great for sensitive and dry skin. Apply over face, neck and décolleté, morning and evening. 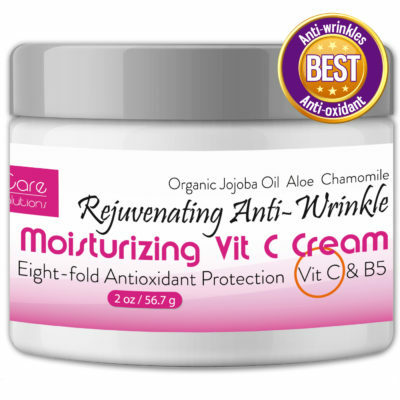 Click and get your best Vitamin C cream NOW! REJUVENATING ANTI-WRINKLE BLEND – All-natural blend with Vitamin C and eight-fold antioxidant protection combined with Vitamin B5, Organic Jojoba Oil and Coconut Oil for a lightweight, ultra-effective daily facial moisturizer made for all skin types. To be used morning and evening. HIGHEST QUALITY NATURAL AND ORGANIC INGREDIENTS – We use only the best premium moisturizing ingredients like Organic Coconut Oil, Organic Aloe Vera, Organic Jojoba Oil, Chamomile and other oils and antioxidants leaving you looking youthful and radiant. Our organic, anti-wrinkle, anti-aging, facial moisturizer hydrates and softens delicate facial skin to stop the signs of aging. SOMETHING FOR EVERYONE – Formulated with the highest quality ingredients, this new moisturizing cream is surprisingly gentle and the perfect solution for even the most sensitive skin types. No matter if you’re a man or woman, our infusion of vitamins and clinically proven ingredients are exactly what your skin needs to look beautiful! 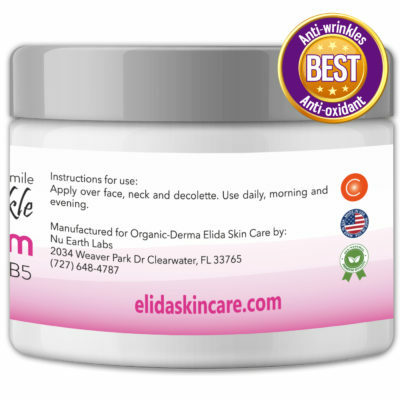 BEST MOISTURIZER – Our cream heals, repairs, calms and brightens giving you an even skin tone and smooth, radiant skin! Non-GMO, fragrance, paraben and cruelty free. Made in the USA. We expect only the best results from the products we use at home, and we know you want the same. When you buy with us, you’re not only buying superior quality, but you buy a natural and healthy product. 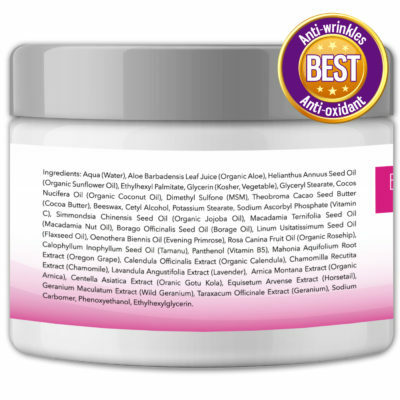 Ingredients: Aqua (Water), Aloe Barbadensis Leaf Juice (Organic Aloe), Helianthus Annuus Seed Oil (Organic Sunflower Oil), Ethylhexyl Palmitate, Glycerin (Kosher, Vegetable), Glyceryl Stearate, Cocos Nucifera Oil (Organic Coconut Oil), Dimethyl Sulfone (MSM), Theobroma Cacao Seed Butter (Cocoa Butter), Beeswax, Cetyl Alcohol, Potassium Stearate, Sodium Ascorbyl Phosphate (Vitamin C), Simmondsia Chinensis Seed Oil (Organic Jojoba Oil), Macadamia Ternifolia Seed Oil (Macadamia Nut Oil), Borago Officinalis Seed Oil (Borage Oil), Linum Usitatissimum Seed Oil (Flaxseed Oil), Oenothera Biennis Oil (Evening Primrose), Rosa Canina Fruit Oil (Organic Rosehip), Calophyllum Inophyllum Seed Oil (Tamanu), Panthenol (Vitamin B5), Mahonia Aquifolium Root Extract (Oregon Grape), Calendula Officinalis Extract (Organic Calendula), Chamomilla Recutita Extract (Chamomile), Lavandula Angustifolia Extract (Lavender), Arnica Montana Extract (Organic Arnica), Centella Asiatica Extract (Oranic Gotu Kola), Equisetum Arvense Extract (Horsetail), Geranium Maculatum Extract (Wild Geranium), Taraxacum Officinale Extract (Geranium), Sodium Carbomer, Phenoxyethanol, Ethylhexylglycerin.